I consider myself very lucky and am very grateful to get the opportunity to always dine out at such delicious establishments. 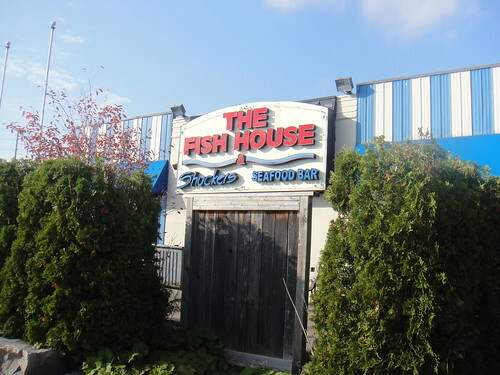 Today, my friend Betty and I visited The Fish House in Markham for lunch. 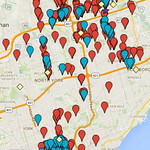 It’s situated on the corner of Woodbine and John Street, an intersection that both of us (and probably some of you reading now) are familiar with; having passed by on many occasions. We both never really noticed this restaurant but it turns out that this place is extremely popular and really, really good! We stepped into the restaurant at 1 p.m. and the large space — apparently it sits up to 300 people! — was bursting with lots and lots of people having lunch. The walls of the restaurant were decorated with lots and lots of plastic fish. It was really neat. 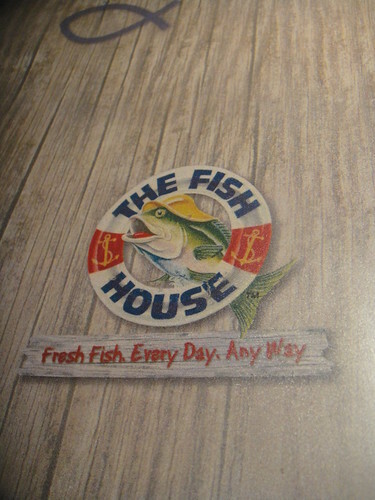 Even one of their menus on the walls was decorated with hand drawn fishing poles. Look out! 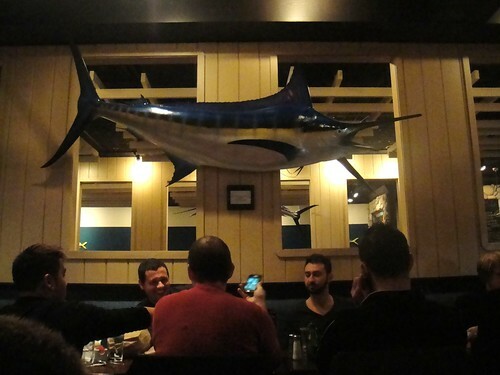 There’s a sword fish above your heads! We were seated at one of the many spacious booths. We were attended to very quickly and ordered our drinks. We already knew what we were going to order since we were going to participating in Savour York Region Restaurant Week (view my first visit to a participating restaurant earlier this week). It just so happened that there was a large table of patrons just leaving, so our server attended to them before us. However, our server was so nice when he returned and said, “Thank you for your patience”. After we placed our orders, the appetizers arrived very quickly! We were impressed. 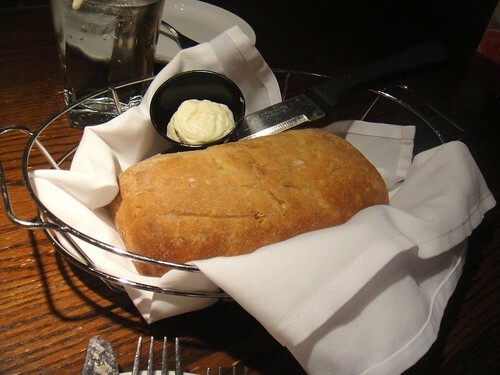 I asked our server about complimentary bread — as most restaurants do offer you bread before your meal. He responded that they usually only serve complimentary bread during dinner and on request, and since I asked, he ordered the kitchen to bake us a fresh loaf. How nice! Our appetizers were yummy. 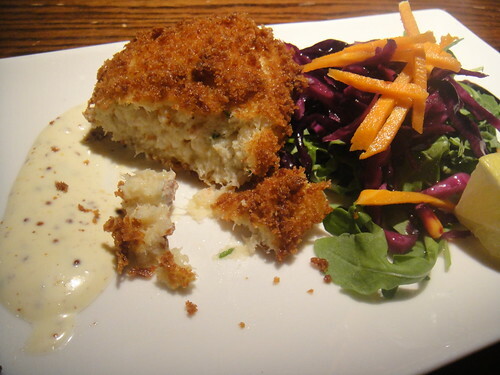 I almost always order crab cakes when I see it on prix fixe menus so this was not a surprise. I liked how their Shrimp and Cod Cake was full and stuffed with a lot of shrimp and cod meat. It was totally generous. The arugula and roast corn salsa was very fresh and a good start to the meal. I was very glad that I did request the bread because it turned out to be muy delicioso! It arrived hot and fresh and wrapped in black cloth — I cut a loaf and smeared some of the super soft butter on to it and the butter immediately melted. A bite into the bread and the taste was just so unique. It tasted a little sweet but was so soft and the melted butter accompanied it perfectly. 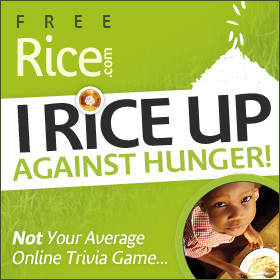 I was so impressed! By this time, our mains had arrived. Betty and I both ordered the same apps and the same mains as well. 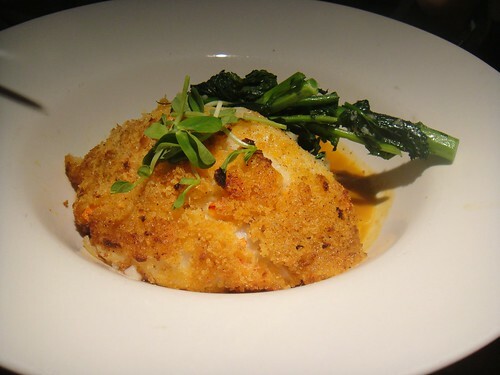 The basa looked good and was incredibly soft and well-cooked. I know it seems like I say everything is good and that everything tastes “soft” in my reviews of food, but this fish really was so well done. I gobbled it up pretty quickly along with the perfectly blended beurre blanc sauce and the bits of lobster that were in it. 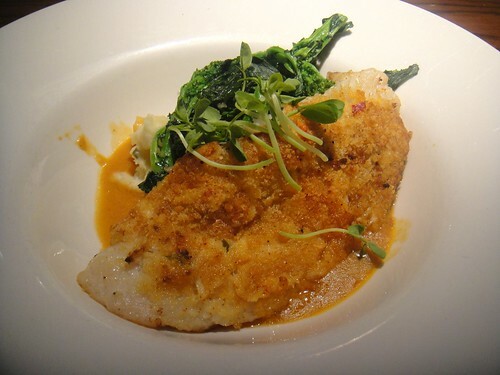 Underneath the fish and rapini, there was some yummy mashed potato. I loved this dish and would highly recommend it. By the time I got to the last few bites, I was extremely full. The mashed potato really did it for me. But, man, it was SOO good! When dessert arrived, we each chose different desserts. 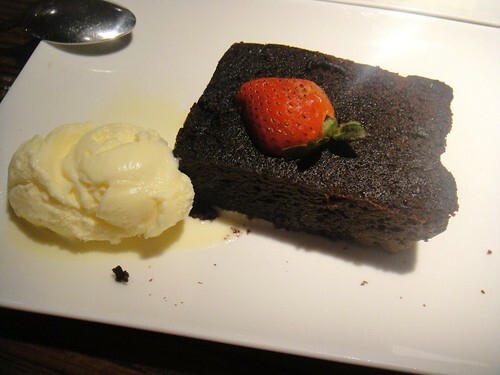 I usually love ordering anything chocolate and even though they had a “double chocolate brownie”, I refrained from ordering it since I had just ordered the exact same dessert earlier this week (see Double Chocolate Brownie from Crave restaurant here). Betty ordered it instead and I was able to sneak a few bites from her. 😀 I opted for the apple crumble instead. Interestingly, I chose the better dessert! (Sorry Betty :P) The Double Chocolate Brownie was unfortunately too hard — especially so the longer it was left on the plate — and tasted a little burnt. My apple crumble was HUGE! It was the size of my fist; probably bigger. 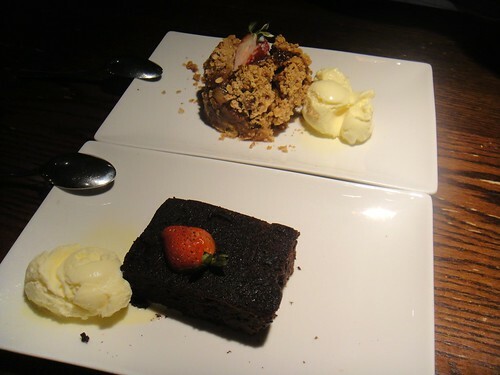 Both desserts came with some vanilla ice cream. 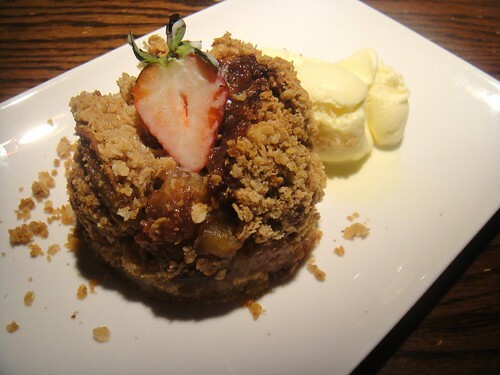 The apple crumble was fresh out of the oven since it was extremely hot. It tasted of sweet granola and the inside of it was puréed apples. It was pretty good. I was so full from everything that I almost couldn’t finish the dessert. The meal was so worth it and I am already contemplating another visit here. Their menu has so many fresh seafood options including lobster tails, fish tacos, oysters, “bang bang shrimp”, and so much more. I’m really excited to come back lol. I also really appreciated their great service. The server came back to check on us many times, and I especially thanked him for bringing the bread. 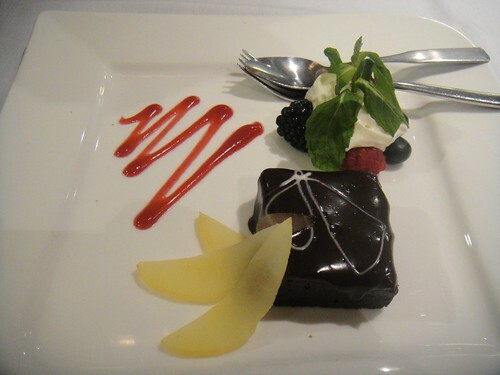 This entry was posted in Food and tagged @SavourYR, apple crumble, basa, cod & shrimp cake, double chocolate brownie, food blog, foodie, Hawaiian bread, lobster beurre blanc, Markham, restaurant review, Restaurant Week, Savour York Region, seafood, The Fish House. Bookmark the permalink. Thanks for preserving very fond memories of this place – it was one of my favourite seafood places. Sad to see it gone. Thanks David for the comment. I agree as well about its absence. It was a great restaurant!